The hazelnut tree blooms and pollinates in the middle of winter. Wind carries the pollen from catkins (male flowers) to small red female flowers, where pollination occurs. The flowers remain inactive until spring, when fertilisation completes and the nuts begin to develop. The natural growth habit of the hazelnut is a bush, or multi-stemmed small tree as found in Turkey and Southern Europe. In the US, hazelnut trees are grown as single trunk trees that can grow to 5 metres or more. All varieties of hazelnuts require cross-pollination in order to produce nuts, so every planting requires several compatible varieties. Ennis, a later and heavier yielder compared to Barcelona, produces a larger nut suitable for both in shell and out of shell production. Lewis produces a medium nut, whilst Casina produces a small nut. Hazelnut trees should be in commercial production when they are about 6 years old, and a well managed orchard should remain active for 40 years or more. The nuts mature during the summer months (turning in color from green to hazel) and are harvested in late summer and early autumn when the nuts fall to the ground within a short period. The nuts are picked up by hand or harvested mechanically, washed, dried and sorted by size. There are very few diseases or pests in Australia that harm Hazelnuts, due to our strict quarantine laws. For example; a significant problem disease affecting the USA hazel crop, Eastern Filbert Blight (EFB), is not present in Australia. Pollinisers are required in Hazelnut orchards because the cultivars are self-incompatible. There must be enough genetic difference between the pollen providing variety(male), and the main nut producer(female) for fertilisation of the flower, and subsequent production of a nut, to occur. Thus polliniser selection is very important. 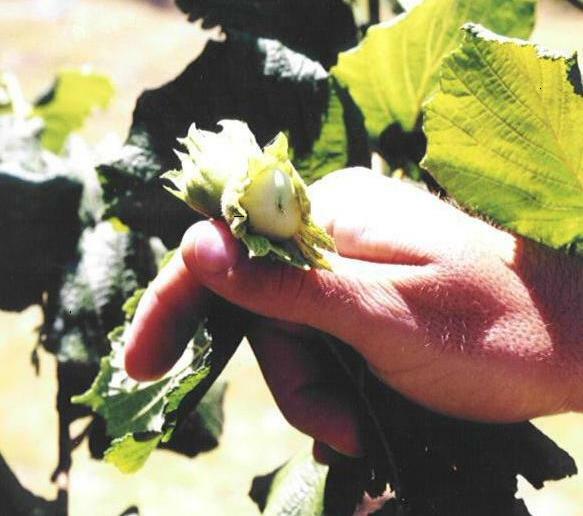 There is some detail on compatible varieties on our sales page, and further information in our ebook on Cultivating hazelnuts in Australia. Contact us to purchase a copy of the ebook. Whilst we recommend a ratio of at least 20% of pollinisers to the main cultivar, in Australia, we find that spacing is also a relatively important issue. Hence it is advisable to use 15 - 20 metres as the maximum distance from any main cultivar to a polliniser. Generally hazelnuts are planted 3 metres apart and 6 metres between rows. Establishing a productive hazelnut plantation requires matching of the main nut variety with appropriate pollinisers. Three to six polliniser varieties are planted for each main crop variety, which includes Early, Mid and Late pollen shed varieties. Choices of varieties to suit intended market; such as table nuts, confectionary or oil production, as well as maximization of yields form part of the consultation process. The below table is not an exhaustive list and there are other alternative varieties. The polliniser varieties are commercial varieties that also produce nuts.